A new study found primary bans on texting while driving keep motorists safe. Outright bans on texting while driving save young lives, according to a new study released by the University of Alabama at Birmingham School of Public Health. Laws that allow police officers to pull over drivers for texting saw fewer deaths than those that use secondary enforcement of texting bans, meaning officers must have another reason to pull the vehicle over, such as dangerous driving, speeding or running a signal, according to a study published in the August issue of the American Journal of Public Health. To find out, Ferdinand conducted a longitudinal panel study that explored within-state changes in roadway fatalities after the enactment of state texting-while-driving bans, according to Science Daily. She used roadway fatality data captured in the Fatality Analysis Reporting System between 2000 and 2010. Primary texting bans, Ferdinand found, were associated with a 3 percent reduction in traffic fatalities among all age groups. This translates to an average of 19 fewer deaths per year in states with such bans. 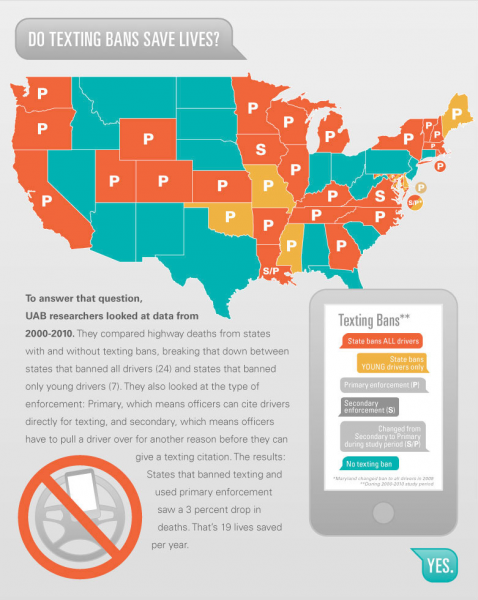 Click the image below to download a .PDF that breaks down the states and their various laws on texting and cellphone use while driving. Regardless of its legality, texting-while-driving is a problem across the country. A recent Centers for Disease Control study found 31 percent of drivers ages 18-64 reported they had read or sent a text or email message at least once within the 30 days prior to being surveyed. In 2011, 3,331 people were killed in accidents involving a distracted driver and 387,000 were injured. Age seemed to be a factor in which types of bans were most effective. Ferdinand told Science Daily that bans on texting cut down on fatalities among individuals younger than 21, and bans on the use of cellphones altogether reduced deaths among older drivers. 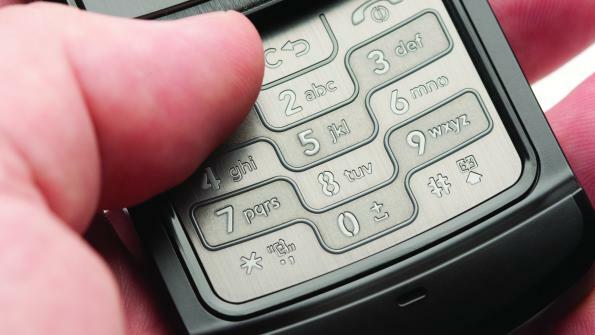 Texting bans alone, she said, did little to affect fatality rates on those older than 21. Ferdinand told Science Daily that her results could help policymakers improve roadway safety by demonstrating which laws are most effective in reducing deaths among various age groups. She says her results may also convince lawmakers in states with secondary enforcement to enact primarily enforced bans. Click here to download a .PDF of the study. Note: registration required.